The morning after witnessing a spectacular meteorite shower, Cory Shembo and his girlfriend Lana didn’t expect to wake up immortal. I liked this book more than I originally thought I would. 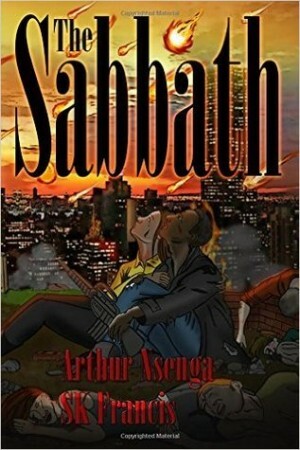 I like end of the world style books and this one had a cool concept with the disease that stopped everyone from dying. I've never read anything like that before in a dystopian so it was interesting. The beginning was far more intriguing to me than the rest of the book. It got to a point where it got a little boring and then the plot went a way that I didn't expect it to and I'm still trying to figure out if I liked that. Cory and Lana are on their way home from a dinner party when the sky starts raining rocks that seem to be on fire. That emits a gas that makes everyone fall asleep for over twenty-four hours. When Cory makes it back home his sick mother is nowhere to be found. It doesn't take long for the new world, post end of the world, to emerge and they quickly learn how to live. Will Cory ever be able to find his mom? Will they be able to thrive in a world where they can't die but violence is at an all time high? I didn't really like Lana and Cory together. Which is weird because I normally root for the love birds to make it but I found them annoying. They made everything more complicated than it needed to be. Cory wasn't good at voicing his feelings (like every other man) and Lana really wanted him to (like every other woman). He thought protecting her was showing that he loved her and she didn't. The whole time I was just like shut up and kiss already. Then the whole Doug and Destiny thing, really did that need to be in here? It was just annoying to me. For a dystopian it's pretty good. I liked the concept though I didn't feel that connected to the characters. If this is a series then I think this was a good setup for the next in line.